These men would do Roald Dahl's parson proud. Like the character in his short story Parson's Pleasure, who went scouring the English countryside persuading ignorant country folk to part for a pittance with furniture they thought was worthless, but was actually an exquisite Chippendale commode or pricelees Queen Anne chairs, a few French collectors have zeroed in on Le Corbusier's forgotten legacy in Chandigarh and made a killing out of it. 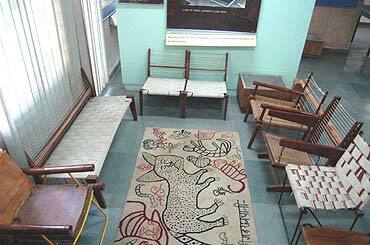 Buying heavily at routine government auctions of "junk" furniture, stalking old employees of Corbusier and his cousin and collaborator on the Chandigarh project, Pierre Jeanneret, and acquiring neglected artefacts lying with them, these collectors have bought symbols of Corbusier's heritage—from manhole covers to wood-and-cane chairs—for as little as Rs 100, restored it to pristine perfection at a workshop in Delhi and shipped it to exhibitions and sales at Paris and New York galleries. As recently as June 5, leading auction house, Christie's New York, auctioned off around 50 lots of furniture and other artefacts designed by Le Corbusier and Pierre Jeanneret at extraordinarily high prices . They all came from the collection of Eric Touchaleaume, a French dealer who has been on an active buying spree in Chandigarh for the last few years. At the Biennale des Antiquaires held at the Grand Palais in Paris in September last year, yet another Frenchman, Patrick Sequin, proudly displayed his 'collection' from Chandigarh. If the French, Swiss-born Corbusier made Chandigarh, the city in turn came to be recognised as his most famous work and put him right up there among the world's greatest architects. It's a living, breathing, inhabited legacy, one that's evident not just in the stunning capitol complex of the city's buildings, its wide boulevards and modernist mansions, but also in the umpteen fixtures designed for these buildings and public places such as the concrete lights at Sukhna lake, the models for bas reliefs in many buildings or even the blueprints of architectural plans. It lies as much in the furniture—office chairs, tables and stools—that Pierre Jeanneret designed specifically to fit in with the architect's vision for the city. Simple, functional and low cost, most of these designs were mass-produced by different local furniture makers. But oblivious to its worth, this rich heritage today lies carelessly strewn around in various offices, gathers dust in government storerooms, or is sold off at auctions. A lot has been replaced by newer, fancier furniture. "No one wants this plain furniture any more," says Balwinder Saini, a senior architect in the UT administration whose office is one of the few which still retains some of the original furniture. It was only when a pair of stools fetched ,23,400 at a Paris sale that Chandigarh woke up in absolute disbelief. "For sometime now I've seen those wood and cane benches being used by security guards outside some judge's houses," says an architect. "No one even gives them a second look." Except for these collectors whose canny, covetous eyes readily spotted what the administration sat blindly on. Cashing in on ignorance in some cases and the connivance of corrupt officials in other cases, they made merry plundering the Le Corbusier-Pierre Jeanneret artefacts and whisking them away overseas. Till two senior professors from the Chandigarh College of Architecture drew attention to the "organised looting" of the city's heritage. They were tipped off by architect colleagues in France and Switzerland. Rajnish Wattas, principal of the Chandigarh College of Architecture, told Outlook, "Some architects and academics whom I met at a conference in Switzerland this February were outraged at the manner in which Corbusier's legacy is being sold off by Chandigarhians. " Professor Kiran Joshi, coordinator of the Chandigarh Heritage Project, procured a catalogue of one of these sales and then apprised the Chandigarh administration of the matter. In response, the administration has, for the first time, set up a committee to identify and protect all heritage furniture and fixtures lying in the storerooms of various government departments. The committee is yet to hold its first meeting. "What is worrying," says Wattas, "is evidence of such furniture in good condition being sold off by showing it as junk." Adds Joshi, "I know that Touchaleaume was after the Sukhna lake lights for a long time. He chats up people in the know in Chandigarh and has contacts at lower levels in the UT architecture department." Furniture from the private collections of some employees and associate architects who worked with Corbusier in the late '50s has also appeared at the auctions. M.N. Sharma, a former chief architect who worked with Corbusier, is distraught that he has none of the Jeanneret-designed furniture in his house any more because, as he told Outlook, "My children got rid of it when I went abroad for a few years." Particularly vulnerable now are the hundreds of sketches and drawings of various buildings as also the woollen tapestries in the high court and the assembly. Joshi points to the huge cache of documents and models lying in the storerooms of the chief architect and the chief engineer, almost as trash, which needs to be retrieved and taken care of. "Many of the things are now simply not there. For example, a model of the Open Hand monument (Chandigarh's symbol) and models of open air theatres are missing, although Corbusier's letter says he sent them to Chandigarh," she says. One such cedarwood model was of the Tower of Shadows in the capitol complex, which was auctioned for $33,600. It was executed by Giani Rattan Singh (his son is now an employee of the architecture department) who was then the official maker of architectural models of Corbusier's buildings. Nothing illustrates the carelessness of those responsible for protecting Chandigarh's heritage better than the saga of the three tapestries designed by Corbusier himself for the assembly building in 1960. In 1994, a 30 ft by 70 ft tapestry at the entrance hall of the Punjab Vidhan Sabha went missing. No one knows where the original is, and a replacement has now been put up there. In 2002, two larger tapestries in the Council chamber now used by the Haryana Vidhan Sabha were replaced by new ones which are inaccurate copies of the original. The two badly moth-eaten and torn original pieces have been lying in a storeroom of the engineering department since then. Corbusier had also designed nine tapestries for the high court, of which the largest, in the chief justice's court, was fortunately restored by the National Museum a couple of years ago, when the media drew attention to its condition. The tapestries were woven by the East India Carpet Company, Amritsar, following Corbusier's detailed drawings and coloured sketches, inspired by the Punjabi craft of durrie weaving. Just a couple of these drawings can be seen in the city museum, while the Paris-based Foundation Le Corbusier has many more. Corbusier's grand natural concrete constructions too are urgently in need of conservation. In 2002, the Chandigarh administration, in collaboration with Foundation Le Corbusier, organised an international seminar to deliberate on ways to conserve the structures which have begun to show signs of wear and tear. Similar concrete buildings by Corbusier in France have been restored with new techniques, but the scores of copies of the seminar's deliberations are lying unsold in the architecture college. Ironically, people like Touchaleaume and Sequin have been buying them up to distribute along with their catalogues!